Born to provide you with the latest facts and information about nutrition and health as well as recipe and meal ideas, photos and foody tidbits. This is, essentially, a plug of my breakfast from this morning but it was delicious, balanced and healthy fulfilling all major food groups! 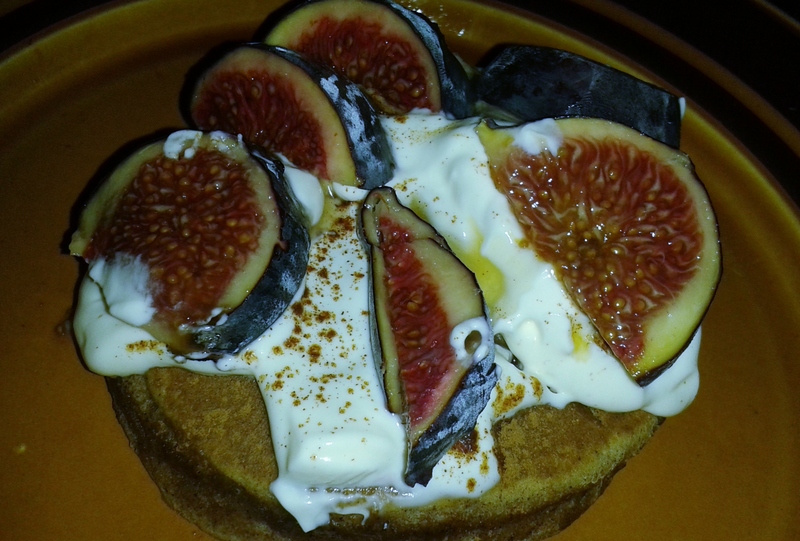 Figs are a really good source of fibre so great for lowering cholesterol and preventing constipation (sorry, perhaps not the best breakfast topic but an important one none-the-less!). They also contain a good amount of potassium which can help to keep the blood pressure normalised – potassium is found in most fruit and vegetables in varying quantities so if you’re eating your 5-a-day then you’re probably getting enough potassium. If you can’t find fresh figs then you could use dried ones but the texture and flavour of fresh figs is definitely more subtle, sweet and fresh. If you wanted to substitute the cinnamon pancake for an American-style plain or lemon flavoured one that would work just as well or you could make your own thin (English or French-style) pancake. To keep the calories similar just make sure the weight of the pancake is no more than 65g and that you don’t use too much fat when cooking – 1 tsp. of oil or butter in a hot pan should do. There’s not much to it really! * Serve and enjoy – mine was wolfed down in less than 2 minutes!